Miniature Schnauzers make fantastic family pets. They are energetic, active, and have a huge personality. Highly intelligent, the breed responds well to training (if you can work past their stubborn streak, that is). But even though they do tend to have a mind of their own, they are eager to please. While they are little adventure dogs that live for excitement and exercise, they also love spending the day at home with you. If you’ll let him, the Miniature Schnauzer will be your best bud. Just remember, the Mini Schnauzer is social and affectionate. He will not do very well if not given a sufficient amount of attention. The Miniature Schnauzer originated in mid-to-late 19th century Germany. The breed was developed from the Standard Schnauzer by crossing with smaller breeds like the Affenpinscher and Poodle. This smaller-sized version was the perfect farm dog. The guarding instincts remained, and the compact size made for an excellent ratter. In 1924, Mini Schnauzers were brought to the United States. Only two years later, the American Kennel Club (AKC) accepted registration of the new breed. While owning this breed can be very rewarding, it’s important for you to understand what caring for a Miniature Schnauzer entails. As with any dog, your Miniature Schnauzer has a few basic needs that you’ll have to provide for. These include nutrition, grooming, exercise, training, and health. Miniature Schnauzers need a balanced diet. This includes a combination of proteins, fats, carbohydrates, vitamins, and minerals. Be aware, though, that too much fat in this breed’s diet can lead to health issues. Miniature Schnauzers tend to overeat if given the chance and are prone to weight gain. Because of this, it’s important to regulate what and how much they eat. The amount of food this breed needs is determined by activity level, metabolism, age, and overall health. Labels on dog food give an approximation of how much to feed based on your dog’s weight. This is definitely a good place to start. However, adjustments may need to be made depending on your individual dog. Speaking with your veterinarian can give you a good idea of exactly how much your Mini should be eating. As a general rule of thumb, a young adult Mini Schnauzer should eat between ⅓ to ½ cup of dry food twice daily. Again, several factors affect feeding amounts, but these tips should give you a good starting point. Keep an eye on your dog to make sure he’s not too skinny or too pudgy and adjust if needed. Grooming a Miniature Schnauzer is a bit more intense than doing a quick brush and then calling it quits. Miniature Schnauzers have a double coat. The top coat is wiry and serves to repel dirt and brambles, and the undercoat is soft and cotton-like. Considered to be hypoallergenic by the AKC, this breed’s coat will shed very little. However, the trade-off for having less fur on your furniture is that this dog needs a regular haircut. Your Mini will need to be groomed every five to eight weeks. This usually means a trip to the groomers unless you want learn to clip the coat on your own. In between visits to the groomer’s, you’ll need to brush your Mini Schnauzer two to three times a week. And don’t forget his beard! It’s very cute all clean and fluffy, but it doesn’t look so great with food bits stuck in it! A quick wipe down of the mouth area is a good idea after mealtimes. Your Mini Schnauzer also needs the basic grooming care required by all other breeds. Check his ears regularly for signs of irritation or infection. Brush his teeth at least once a week to keep his pearly whites white. While not the most physically demanding breed out there, Miniature Schnauzers do still need their exercise! This breed is very versatile and can adapt to apartment living as well as country living. We recommend that your Mini gets at least 30-45 minutes of exercise daily. While they do not require a yard, a daily walk is definitely a must. Your Miniature Schnauzer also would benefit from some at-home playtime and at least an occasional trip to the dog park. Because Miniature Schnauzers are intelligent and eager to please, they are quite easy to train. However, the breed does have an independent streak and can be a bit stubborn. Proper and consistent training from an early age is key to keeping your Mini Schnauzer in check. 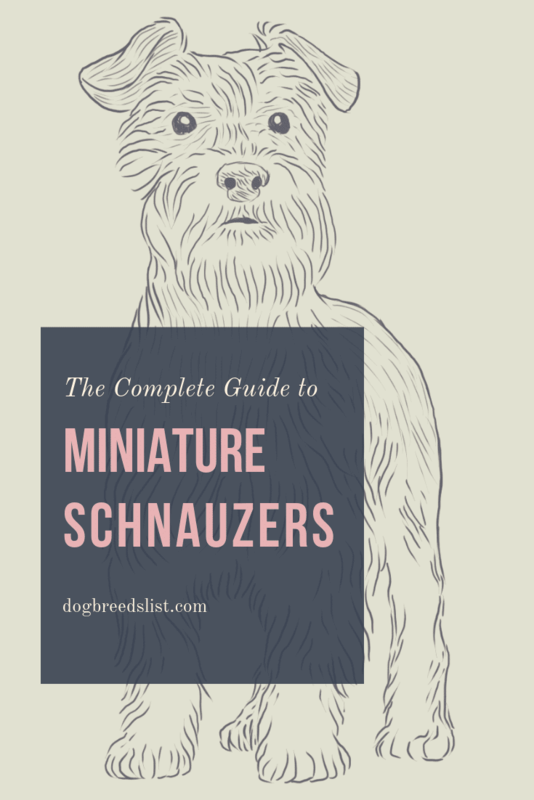 Your Miniature Schnauzer should learn the basics rather quickly. But please don’t stop there! This intelligent and energetic breed is capable of so much more. Keep training your Miniature Schnauzer throughout their life. They love learning new tricks, and training is a great way for you and your Mini to keep your bond strong. Miniature Schnauzers are generally a very healthy breed. Their average life expectancy is 12-15 years, and they tend to not show signs of aging until later on in life. The Miniature Schnauzer is part of the Terrier Group. And, like I mentioned above, the breed comes from Germany. This makes the Mini Schnauzer unique among terriers, since the majority of terrier breeds originated in the British Isles. These British-born terriers were bred to burrow underground in search of small prey. However, the Mini was bred instead for ratting. Well, it’s an interesting fact. But more importantly, it means that the Miniature Schnauzer is actually pretty different from your run-of-the-mill terrier. They may have the typical terrier confidence. But they lack the confrontational streak that gets other terriers into spats at the dog park. On the contrary, Miniature Schnauzers are friendly and sociable. They are also more obedient and willing to please than your typical terrier. Miniature Schnauzers are generally known to be barkers. However, they are not your average yappy-type breed. The Mini has a very distinctive bark that is very sharp and high-pitched. Due to their history as farm guard dogs, they instinctively tend to alert their owners to what is going on around them. They may bark when the doorbell rings, when they see a stranger outside the house, etc. Your Mini Schnauzer should not bark incessantly. Are they getting enough exercise and attention? Are they showing other signs of separation anxiety when you’re away? Fortunately, if these things are the case, there are several ways to remedy the barking behavior and even train your Mini not to bark. We’ve all seen those adorable photos of a the dog that snuggles up to a rabbit, grooms the family cat, befriends a parrot. Unfortunately, the Mini Schnauzer is not that dog. Because of their inbred ratting instincts, they do not typically do well with small, furry pets. With early socialization and training, these prey instincts can be curbed, and with time they can be familiarized with small pets. However, you should never leave the two alone together, as you’ll likely be unable to completely shake the Mini’s instinct to hunt. The small prey thing–it applies to outdoor creatures just as much as it applies to your pet hamster. Be sure your yard is securely fenced, otherwise you may have to chase down your Mini as he chases down the neighborhood cat! Also be aware that the Mini Schnauzer will not do well off-leash unless properly trained to do so. Again, they will be very much inclined to take off after any small, furry thing that catches their eye. Recall practice with these dogs is a must, and a big open field with no fences and no leash should typically be avoided with this breed. Miniatures Schnauzer are easily distracted (curious and energetic breed). It’s not uncommon for your little pup to go wandering off in the middle of a training session. While intelligent and eager to please, the Mini does have a short attention span. When training, keep sessions short so that your Mini Schnauzer doesn’t get bored. Also, keep in mind that variety is more important than simple repetition. Schnauzers are very keen on patterns. So mix it up! Throw in lots of variety to keep your Schnauzer on his toes! The phrase may be a bit cliché, but it applies so well to the Miniature Schnauzer. This breed is a huge people dog. He may be a bit wary of strangers, but the dog will warm up to new people if he sees that you approve of the person entering your home. As for you and your family, the dog will be head over heels. He’ll generally prefer spending time with his people over being around other dogs. And he will often choose a favorite family member in the household. He will be loving and friendly to all in the home, of course. But chances are he’ll choose a favorite to follow around and be the most protective of. The Mini Schnauzer is social, and he needs a lot of love and attention. He will make an excellent companion dog, but be aware that he’ll want to be a part of everything you do. He’ll follow you around the house and always want to be involved. That’s because Mini Schnauzers bond strongly to their owners and love being the center of attention. If you want a dog that prefers to do his own thing and doesn’t mind being alone, then the Schnauzer likely isn’t right for you. But if someone is home a lot of the time, and you want a dog that loves being involved in your life, then the Mini Schnauzer could be the perfect breed! The Mini Schnauzer will always prefer the companionship of his people to the company of other dogs. But the breed usually does do well with other canines. 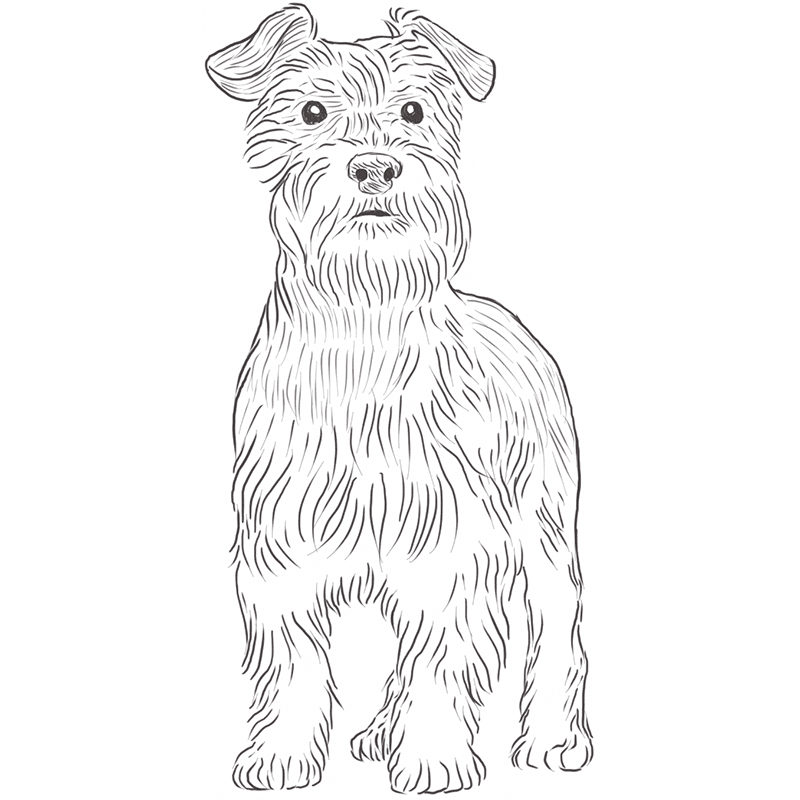 Unlike most terriers that pick fights with other dogs, the Mini Schnauzer is much more canine-friendly. He typically isn’t dog-aggressive. But he can be bold and fearless around large dogs, which can get him into trouble if you’re not careful. Proper socialization is important to creating a friendly and confident Miniature Schnauzer. And with the proper exposure, the Mini is quick to befriend his fellow canines. The Miniature Schnauzer is often an excellent choice for families with children. Individual dogs do have their individual preferences. But for the most part, the breed is considered very child-friendly. This is especially true if the dog has been raised alongside children. In fact, the Standard Schnauzer, from which the Mini descends, was historically used to watch children. He was even given the name “kinder watcher,” (“kinder” meaning “children” in German). It’s important to teach your kids how to interact with the dog. Teach them to not pull on tails or take away food. Also, be sure to supervise young children with your Mini to make sure neither of them get hurt. With a watchful eye and proper instruction to both child and dog, your Mini Schnauzer can become your child’s best friend. If you’re looking for a little lap dog, the Mini Schnauzer is not where you’ll find it. Don’t let their small size fool you. This dog loves to go where you go and do what you do. His small size may not make him the best long-distance jogging partner. But he does do well on long walks and hikes, as he’s able to walk several miles at a time. The breed also excels at dog sports, so if you’re interested in agility training, the Mini could be a good match. They are competitive and can be quite athletic. Dog sports may be a great way for you to bond with and exercise your Mini. The Miniature Schnauzer is a great adventure companion and does need a good amount of exercise. But you can breathe easy knowing that they won’t be bouncing off the walls if given a sufficient amount of exercise. If you provide your Mini with an energy outlet, he will settle down nicely. He may not be a 24/7 lap dog, but most individuals do make very good snuggle buddies. In other words, as long as you’re around, your Mini will generally be happy whether you’re out hiking or on the couch watching TV. Just make sure he gets a good balance of both! Believe it or not, that adorable mustache actually had a purpose. Back in 19th century Germany when the Mini Schnauzer worked as a ratter, his beard was a very essential feature. As every Schnauzer owner can tell you, the Schnauzer beard gets matted and dirty without proper care. Back in the day, though, a Schnauzer with a matted beard had the advantage. When ratting, the thick, matted facial hair served to protect the dog’s sensitive snout from rodents’ sharp teeth and claws. Nowadays, though, it’s just there to be extra cute! Miniature Schnauzers come in all sorts of colors. The most common one of course is salt and pepper. But other recognized colors include black, black and silver, and white. There’s even specialty breeders that breed for more unique colors such as chocolate, liver and tan, and parti and merle varieties. White Miniature Schnauzers are controversial in North America. They aren’t accepted for showing by the American Kennel Club nor the Canadian Kennel Club. Interesting. Especially seeing as the World Canine Organization recognizes them. I guess North America just isn’t good enough for the white Mini! Pure whites are adorable, though. And even though they aren’t recognized, they are still quite common in North America. So, is a Miniature Schnauzer Right for You? But for the right person, the Miniature Schnauzer will make the perfect canine companion. That much is for sure!